Vitamin C, also called ascorbic acid, has a huuuuuge list of functions. It’s an anti-oxidant, which means it helps to keep your cells healthy and reduce risk of cardiovascular disease, diabetes and inflammatory diseases. Vitamin C is also required to make collagen; a type of protein found in connective tissue (skin and blood vessels), which makes vitamin C is essential for muscle maintenance. It activates many hormones and enzymes, including those linked with bile production and liver metabolism. 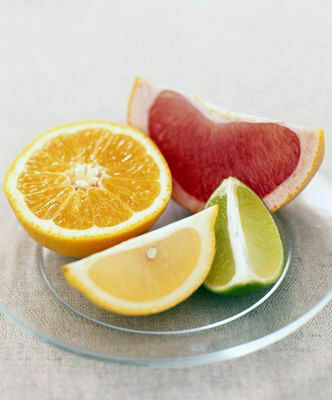 Plus, vitamin C plays an important role within our nervous system, aids wound healing and helps our body absorb iron. See, I said it was a long list! Our bodies are unable to make vitamin C, so all of what we need has to come from our diet. Vitamin C is found in lots of fruit and vegetables; oranges and other citrus fruits, kiwi, mango, blackcurrants, tomatoes, peppers, broccoli, potatoes, sweet potato and brussels sprouts. *People who smoke regularly use up more vitamin C and so may require up to 80mg per day. To put this into perspective, a small orange contains 50mg of vitamin C, a medium sweet potato has about 20mg and a cup of broccoli will provide you around 80mg. As you can see, if you eat fruit and vegetables, you should have no problem reaching your recommended intake! You may have heard stories of when sailors and pirates used to suffer from a disease called scurvy. This is the name given to the disease caused when we don’t have enough vitamin C. Luckily, it’s not very common anymore apart from those who do not consume enough fruits and vegetables. Symptoms include; feeling fatigued, muscle weakness, irritability, pain in joints, bleeding gums and red/blue spots appearing on your skin. The disease is treated by the person taking vitamin C supplements and eating foods high in vitamin C.
Having over 1000mg (20 oranges!) can cause abdominal discomfort, stomach pain, flatulence and diarrhoea. Some people take high doses of vitamin C because they believe that it can help prevent the common cold. There is little evidence to support complete prevention, but high doses may help reduce the severity of some symptoms. In addition, it is likely that anything over 500mg of vitamin C at any one time won’t be absorbed.